© Maria Acosta. All rights reserved. Zinnias that monarchs love in backyard in St. Paul, Minnesota. My garden is a monarch butterfly sanctuary. I grow many of my annuals from seed. Like zinnias, Mexican sunflowers and milkweed. 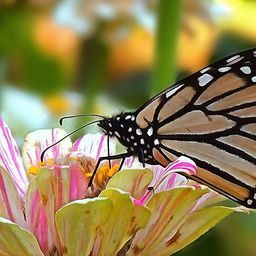 Zinnia flowers and Mexican sunflowers are a must-plant annual for the butterfly garden and a favorite flowers of monarchs. I have had this garden for over 30 years in my backyard. The monarchs keep returning and counted up to 50 of them at one time. This is unusual in my neighborhood the intercity. Date Uploaded: Sept. 13, 2018, 5:11 p.m.